During the Vertical World Circuit 2015, runners from around the world raced up the stairs of eight iconic skyscrapers. 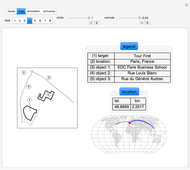 This Demonstration shows a sketch of the skyscrapers, a minimized map of their locations, and short descriptions of the races, towers, and maps. 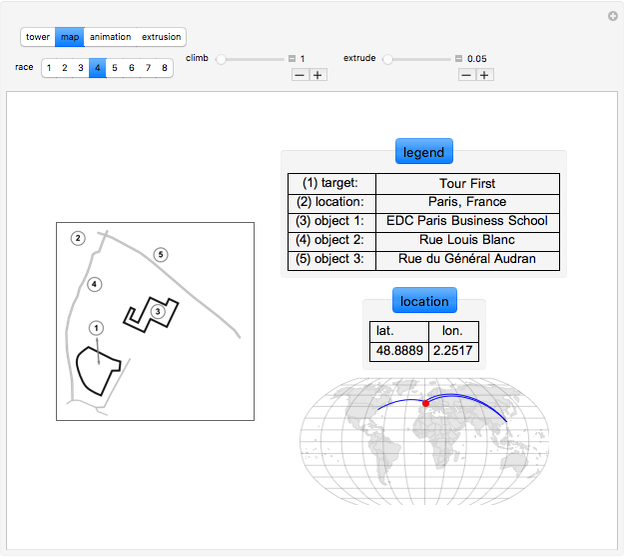 You can see the locations of the races, the trips from city-to-city (including total distances or geo locations), an animation of a stair-climbing shoe, and the extrusion of a staircase. 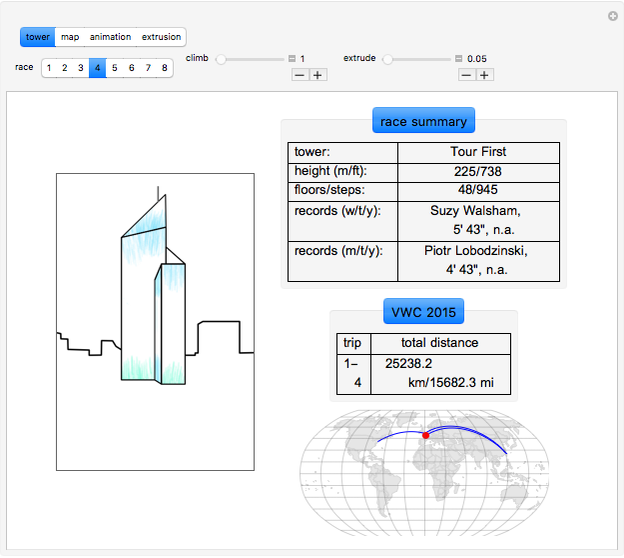 The Vertical World Circuit website  contains all the info about the eight races of 2015. OpenStreetMap  is the source for the minimized maps. 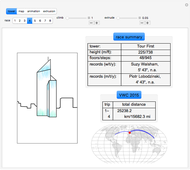 The sketches for the towers and the maps were imported into Mathematica as PNG files. The stair for the extrusion is realized as a NURBS curve and surface. Further explanation for NURBS objects is available at the Wolfram Demonstration by the same author. 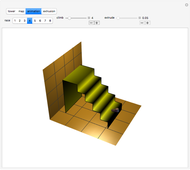 The fully extruded stair surface is used for the climbing shoe animation. The shoe in the animation is just a simplified placeholder for the runners. "Vertical World Circuit." (Apr 28, 2016) www.verticalrunning.org. "OpenStreetMap." (Apr 28, 2016) www.openstreetmap.org. Guenther Gsaller "Vertical World Circuit 2015"